LMS: Spa 1000km Entry list released. The entry list for round two of the LMS 2010 season, the 1000km of Spa has been released, unveiling some noteworthy surprises. Notable mentions go to the appearance of additional entries from both Schnitzer BMW Motorsports (#79), and ProSpeed (#98), including the appearance of a GT1 class yielding a seven car field (as opposed to the single entry seen at Paul Ricard). It is also important to highlight that Formula Le Mans class runners have once again been lumped in with the LMP2 field. The total car count for the event stands at fifty-two. LMS: Post Paul Ricard Race wrap. 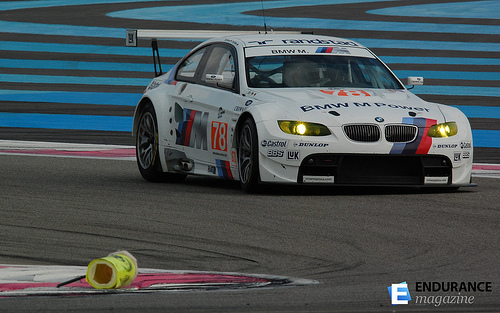 The Le Mans Series 2011 season began in superb style this weekend at Paul Ricard HTTT for the inaugural running of the 8 hours of Le Castellet. The first event of the season played host to a field of high calibre entrants, some seasoned veterans, others trying their hand at endurance for the first time. All in all results were somewhat varied. 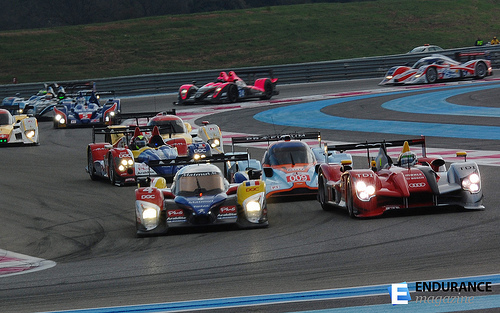 LMP2 and GT2 categories played host to many intense battles and, to the surprise of many, the production of exhilarating racing at Paul Ricard ensued. Joest, Oreca, and AMR entries engage in heated exchange on lap one. - Image Courtesy EnduranceMag / GeoffreyBarre. The opening minutes of the race saw a flurry of movement in prototype and GT classes. As drama struck early in LMP1, class favourites Audi and Peugeot inflicted minor contact upon one another while navigating chicanes on lap one. This allowing the #009 Lola-AMR of Stefan Mücke to assume the race lead (if only briefly), before the the diesels continued their charge. 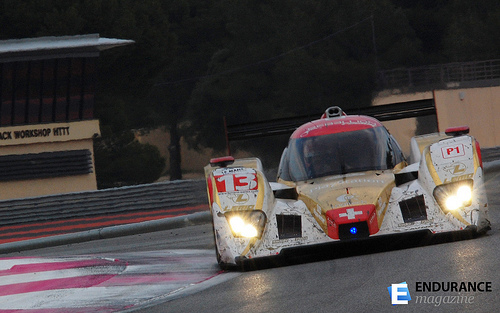 In the later stages of hour one, the #4 Oreca-entered Peugeot’s chances of victory suffered a diminishign blow. As Sarrazin was forced to pitlane as a result of mechanical issues with the car’s airjack mounting system – noticed by crew members during the team’s first pit stop. This failure would prove costly, costing the #4 approximately twenty minutes on repairs, ultimately leading to a seven lap loss on class rivals, Joest. Benefiting from the late race misfortunes of the team’s #6 Oreca01 sister car, the #4 would go on to secure fourth overall. 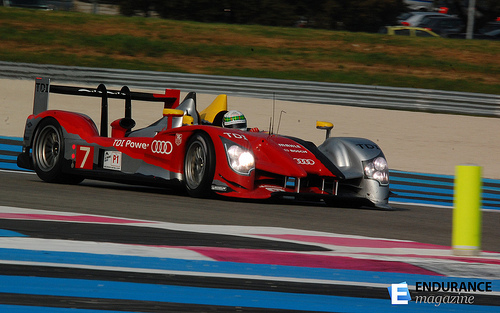 Audi's R15+ turns competitive laps for the first time, during the 8H Le Castellet - Image Courtesy EnduranceMag.fr / GeoffreyBarre. 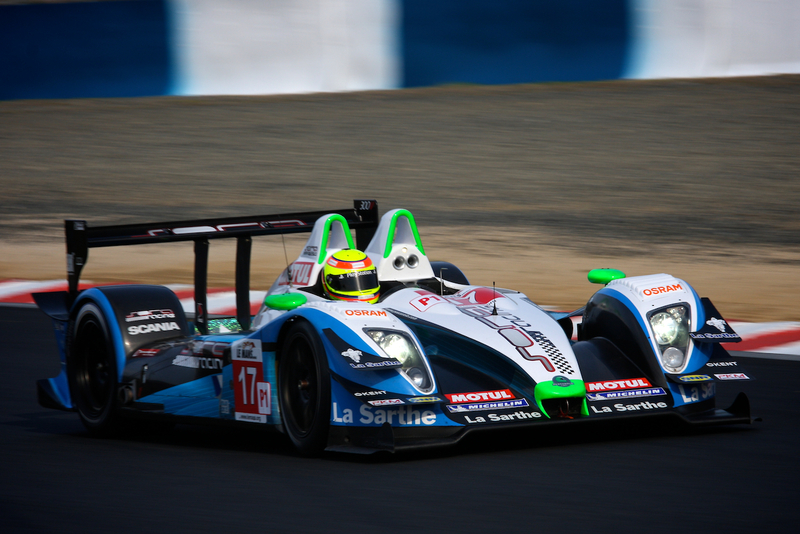 Unhindered after trading paint with the Oreca Peugeot, the #7 Audi (with McNish then at the wheel) would go on to obtain first place from the AMR-Lola. The Scot continued to lap flawlessly in the R15+, maintaining a constant pace of 1:43-1:45s per lap before ceding driving duties to teammate, Capello. Inheriting the car mid-way through hour two of the event, the Italian continued in much the same fashion as McNish. Demonstrating the virtues of consistent lapping and tyre/fuel conservation afforded by Audi’s modified R15+ chassis. The #7 would complete the remaining six hours of the race with minimal difficulty to secure first overall, covering a distance 1540km, and taking double championship points. As a direct result of Oreca’s mechanical dramas, the #009 Lola-AMR inherited second place in the latter stages of the opening hour, maintaining the position for the entire race. Exempting a late race tyre-lockup, the #009 crew of Mücke, Fernandez and Primat would round out an almost faultless showing, taking a well-deserved second place overall, and first of the petrol LMP1 finishers. 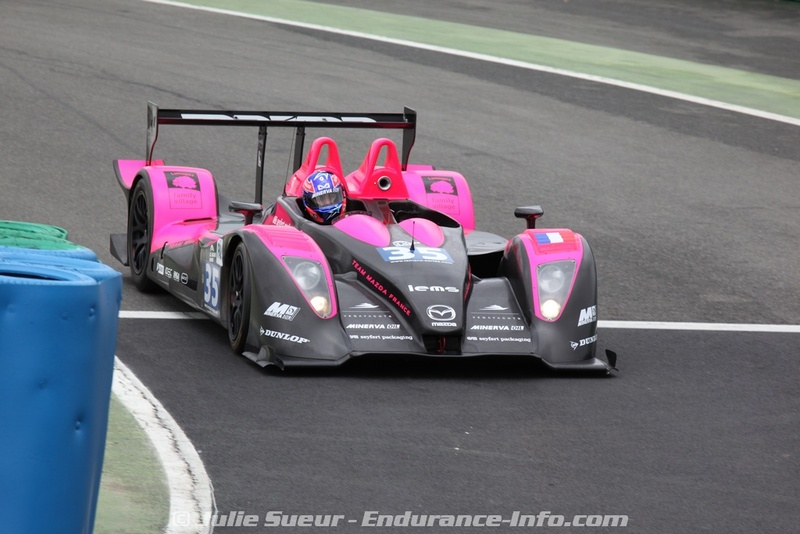 Rebelllion's #13 Lola-Judd.- Image Courtesy EnduranceMag.fr / GeoffreyBarre. After experiencing early-race suspension difficulties with the team’s #12 car, Rebellion managed to turn the tables with their remaining #13 Lola-Judd. 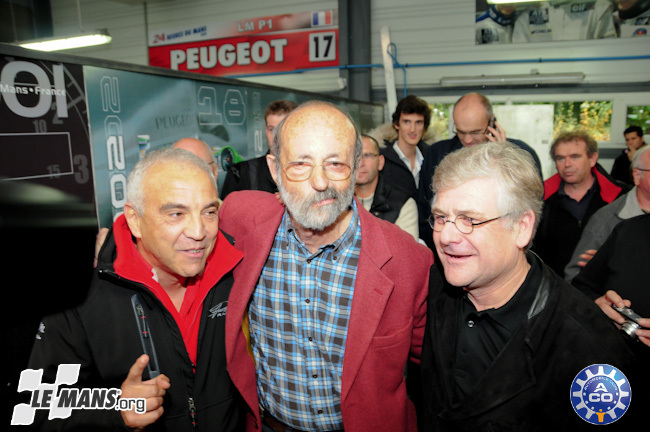 Having been gifted further position in the opening hour of the race (a result of the Oreca Peugeot’s misfortune), the #13 crew of Smith, Boullion, and Belicchi would maintain pace with AMR’s #009 Lola-AMR squad for several hours – even looking likely to challenge the AMR squad for second overall in at certain periods of the race. 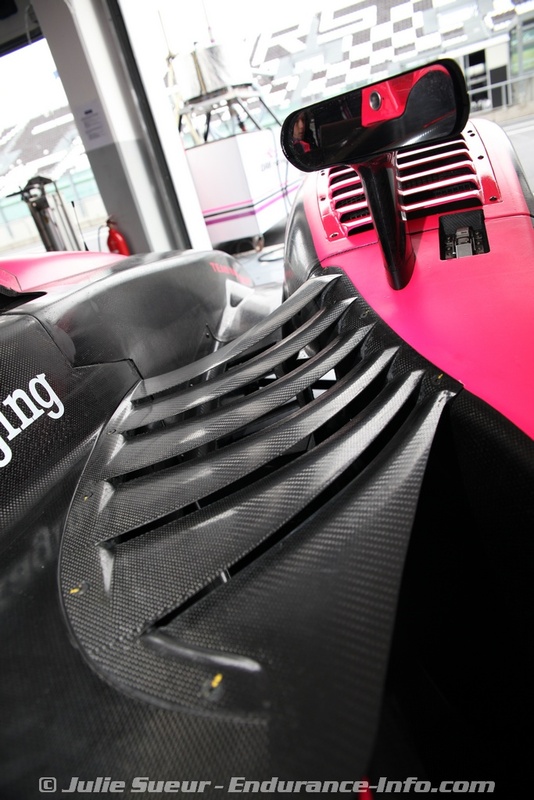 Rebellion’s remaining chassis would ultimately go on to maintain third position to achieve a podium for the squad. 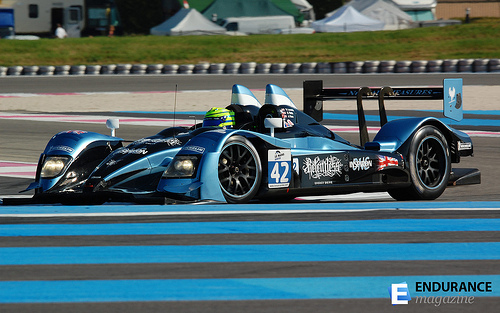 Strakka's #42 ARX01c LMP2 challenger - Image Courtesy EnduranceMag.fr / GeoffreyBarre. Having set the pace during qualifying, Strakka racing surged to an early lead in the LMP2 class, reaffirming the solidity of Acura’s ARX01c package. Reigning champions Quifel-ASM slotted into second, followed by OAK. Opting to maintain a steady pace in favour of single-lap speed, both cars would visibly struggle to maintain pace with Strakka. Despite this, the #42 would later suffer issues in pitlane, placing the Strakka squad five laps down on class leaders Quifel-ASM, who would inherit the lead, followed by OAK Racing’s pair of Pescarolos. In what was (with little doubt) one of the drives of the race, Strakka’s trio of Watts, Kane and Leventis, mounted a dramatic comeback charge. Managing to thread their way through slower GT and prototype traffic (often maintaining a pace comparable with P1 entries), Strakka would regain a five lap margin on class leaders Quifel-ASM, taking victory in spectacular fashion. 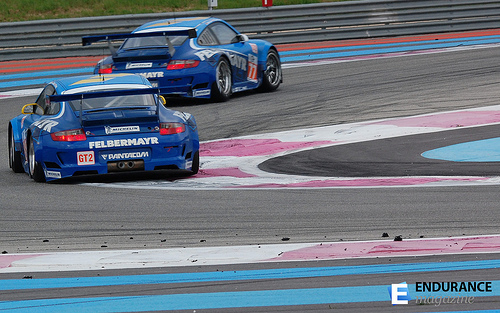 Felbermayr's pair of #77/88 entries running in 1-2 tandem - Image Courtesy EnduranceMag.fr / GeoffreyBarre. Having endured arguably one of the series tightest qualifying sessions in recent history ( positions 1-11 separated by 1.7sec) the GT2 battle looked promising from the outset. Jostling for position commenced early, and in a heated manner with heavy movement at both ends of the category. Pole setter, Bruni commenced the race for AF-Corse by drawing a considerable margin over nearest rivals. Felbermayr’s #77 of Lietz moved from second to seventh from the start in mere seconds. The #96 AF-Corse entry would eventually suffer race-ending engine difficulties during the fifth hour. One of the many Ferrari casualties throughout the day. Although slightly down the order, the #77 would continue to set the pace in GT2, snaring the lead prior to the downfall of the #96, a position the duo of Lietz/Lieb would maintain for the remainder of the event. The #88 sister car of Ragginger/Long/Ried would finish in second place, after avoiding drama to gradually work its way through the field and ensure a Felbermayr 1-2 finish. BMW M3 E92 of Jörg Müller/Dirk Werner - Image Courtesy EnduranceMag/GeoffreyBarre. One of the highlights of the GT2 class was the #78 M3 E92 Schnitzer/BMW Motorsports entry. The Charley Lamm led squad opted for a fuel-efficient strategy,deciding against outright pace in the hope of offsetting their rivals pitstops during the final hours. Drivers Werner/Müller managed to bring the car to third place in the GT2 field during the first half the race before suffering a radiator leak, forcing the team into damage control mode, and losing several laps to the class leader. Werner/Müller would go on to finish sixth in class. Classified as part of the LMP2 category (thus appearing at the deep end), the Formula Le Mans class spent much of the race in the shadow of faster P1/P2 counterparts. A great mistake on the ACO’s part, given that the class provided exciting racing throughout the course of the day. The Hope Pole Vision, DAMS, and AppleWood Seven teams battled furiously throughout the eight hour event, with victory eventually going to to the Gulf-liveried AppleWood seven entry. While the inaugural running of the event didn’t quite deliver the LMP1 mega battle fans may have been hoping for, the LMP2, GT2, and FLM classes provided some great racing for viewers (although the majority of the race wasn’t ‘viewed’ persay – courtesy of our good friends at EuroSport). If Paul Ricard is but a taste of what is yet to come in 2010, LMS is due for what looks to be one of the most action packed seasons in recent years. 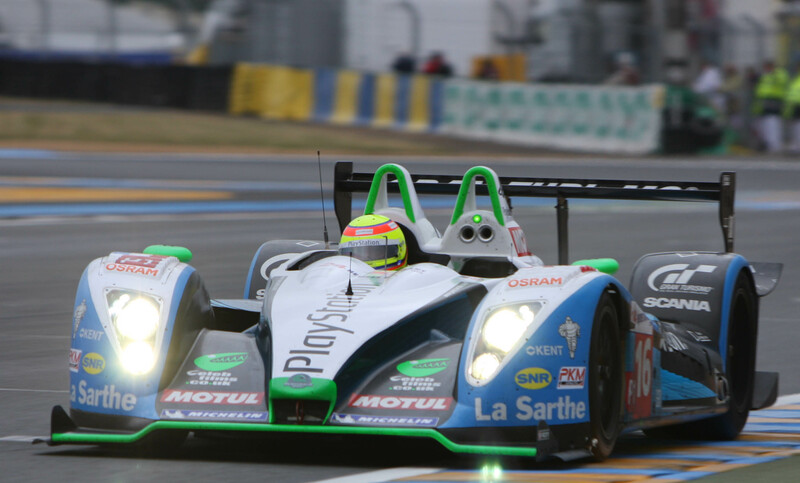 OAK Racing shows off 2010-spec LMP2 Pescarolo. 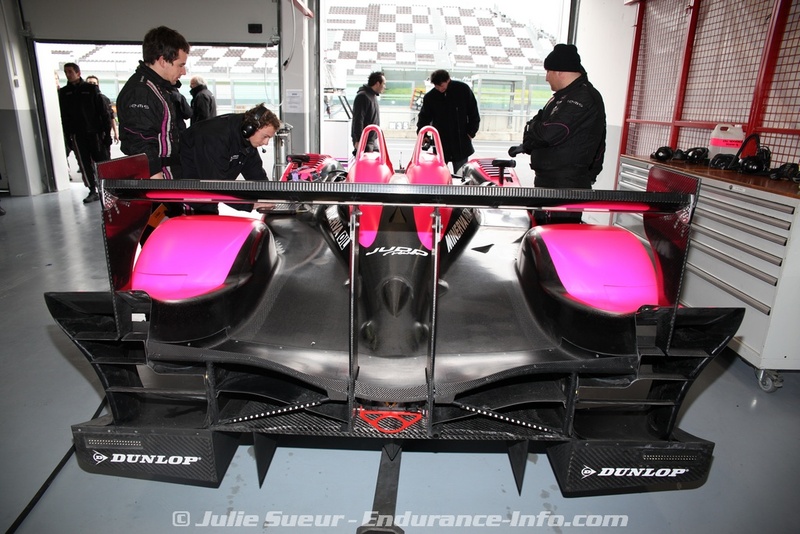 Earlier today French team, OAK Racing unveiled their recently updated, 2010-spec Pescarolo-Judd LMP2 at a rain soaked Magny-Cours circuit. Team driver Guillaume Moreau completed the first laps in the car. While partners Matthieu Lahaye, and team owner Jacques Nicolet are scheduled to receive their first taste of the revised car tomorrow. Although dated, the still-competitive Pescarolo design has been revised to meet 2010 technical specifications, featuring significant adjustments to both front and rear body work. The #35 car seen in testing is utilising what appears to be a reduced-drag setup. With front sections of the chassis (previously open) now sealed. The chassis’ rear bodywork also experienced significant development over the winter. Now featuring a reworked diffuser with particularly distinguished, flared accents. The extent of the changes can be seen in detail, below.